Cliff Striders are creatures found on the island of Vvardenfell. They are related to the Cliff Racers. Young Cliff Striders are called Cliff Skippers and are non-hostile. Zainab Camp at the edge of the camp. 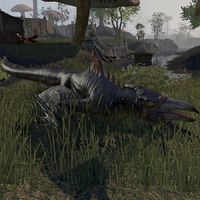 Cliff Striders' Bane 5 Do your part to eliminate the cliff strider menace by killing 100 cliff striders or cliff skippers in Vvardenfell. This page was last modified on 12 September 2018, at 06:47.